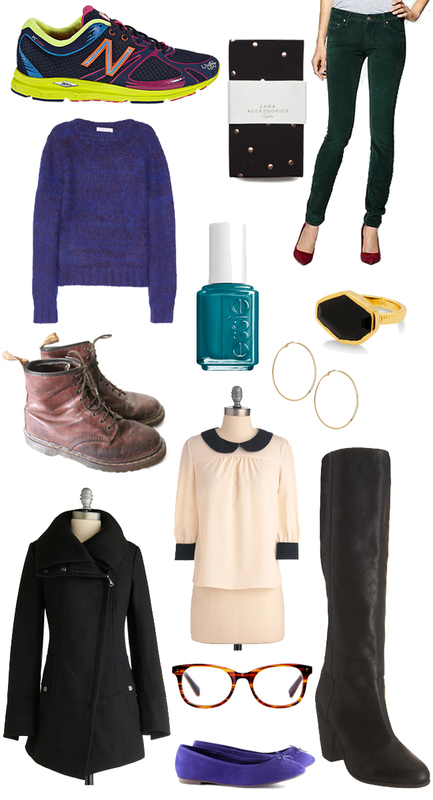 So following up with Deweese and her awesome fall fashion finds, today I'm sharing my fall fashion wish list! While I would love an entirely new wardrobe, what I'm really focused on are shoes and accessories. Those are the things that tend to last several seasons for me, but it is time for me to update! Of course, I could use some new jeans and tops and so I've included a few of my favorites in those departments, too. A little bit of nostalgia! I'm jumping on the crazy sneaker bandwagon. Big time. My cousin chose that nail polish last time we got manicures and I can't stop thinking about it! Those blue flats are from H&M! How cozy does that sweater look? I wonder: Is that jacket kind of "out"? Whatever, I still like it. It's a little more proper than the rest, but that is one simple, classic top that I think I'd wear every week at work. Is there really anything I have to explain about those Rag & Bone boots? I would wear that ring everyday. Hoops! These are a constant wardrobe staple for me. Obviously first on my list are those amazing Docs (I owned the same ones from 1996-2000 and wore them to the ground). Contrary to Deweese, middle school is BACK in my book! Well, some parts. Not this part. I lost my Warby Parkers and so even though they were only 3 years old, I loved them so much I long for them in a nostalgic way. So it is time to get a new (but very similar) pair. Hope you like it! Also, check out more of my wish list items on Pinterest! PS: There was another video this week, watch it here. Yes, I'm still talking about Kendall Charcoal. I'd like to promise that I'll stop someday...but we both know that's a lie! I have the silver color, and they are really cute!